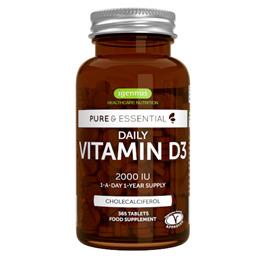 Pure Essentials Daily Vitamin D3 provides the most biologically active form of vitamin D that is easily absorbed by the body and taken up into the bloodstream. Small tablets deliver 2000 IU of vitamin D3, suitable for everyday use throughout the year. Excessive doses of vitamin D3 can upset the delicate ratio of calcium and vitamin D in the body, so higher doses should only be taken for acute periods as needed. 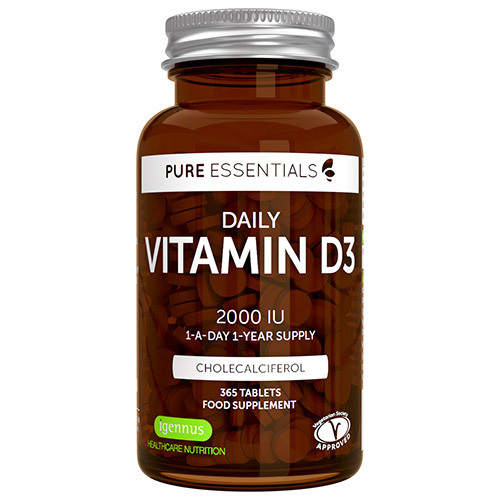 Vitamin D3, also known as cholecalciferol, is the most biologically active form of vitamin D, as it is readily absorbed and easily utilised by the body. Vitamin D3 is a hormone-like vitamin that, as well as playing a role in cell division, contributes to normal muscle function and to the normal functioning of the immune system. It is best known for the role it plays in supporting healthy bones and teeth and this is because vitamin D3 is required to maintain normal blood levels of calcium. A daily intake of 2000IU is considered optimal for ensuring that an ideal vitamin D3 to calcium ratio is maintained, thus preventing potential issues surrounding abnormally high levels of calcium that can result from regular intake of high dose vitamin D3. Adults and children aged 11+: Take 1 tablet daily with food for general wellbeing. If more intensive support is required, the daily dose can be increased to 2-3 tablets daily short term. Do not exceed the stated doses unless advised by a healthcare practitioner. Keep out of the reach of children and away from sunlight. Pregnant or breastfeeding women should consult their doctor before taking any food supplement. Below are reviews of Igennus Pure Essentials Daily Vitamin D3 2000iu - 365 Tablets by bodykind customers. If you have tried this product we'd love to hear what you think so please leave a review.